Ramezani, M. (2014). A queuing-location model for in multi-product supply chain with lead time under uncertainty. Journal of Industrial Engineering and Management Studies, 1(1), 31-42. M. Ramezani. "A queuing-location model for in multi-product supply chain with lead time under uncertainty". 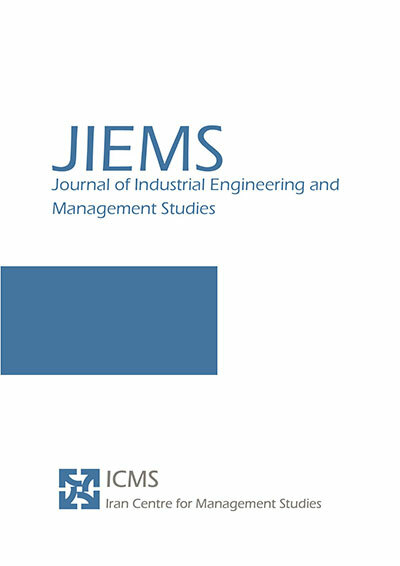 Journal of Industrial Engineering and Management Studies, 1, 1, 2014, 31-42. Ramezani, M. (2014). 'A queuing-location model for in multi-product supply chain with lead time under uncertainty', Journal of Industrial Engineering and Management Studies, 1(1), pp. 31-42. Ramezani, M. A queuing-location model for in multi-product supply chain with lead time under uncertainty. Journal of Industrial Engineering and Management Studies, 2014; 1(1): 31-42. Supply chain network design (SCND) problem has recently been gaining attention because an integrated management of the supply chain (SC) can reduce the unexpected/undesirable events and can affect definitely the efficiency of all the chain. A critical component of the planning activities of a manufacturing firm is the efficient design of its SC. Hence, SCND affords a sensitive platform for efficient and effective supply chain management and is an important and strategic decision in one. This paper presents a supply chain network model considering both strategic and tactical decisions. The model determines location of plants and distribution centers regarding single sourcing and capacity of plants and distribution centers (strategic level) while the shipments have to wait in the queue for transporting from plants to distribution centers (tactical level), which lead to the lead time is incorporated in model. Because of high-impact decision of a supply chain network design, we extend the model in an uncertain environment. To deal with uncertainty where the uncertain parameters are described by a finite set of possible scenarios, the two-stage stochastic programming approach is applied. Finally, a numerical example is given to demonstrate the significance of problem. Daskin MS. 1995. Wiley-Interscience Series in Discrete Mathematics and Optimization. In Network and Discrete Location:499-500: John Wiley & Sons, Inc. Number of 499-500 pp.